With backpacks on and sweat already starting to seep through our shirts, we joined three game German girls and two local guides for a two day trek into the Laos mountains. 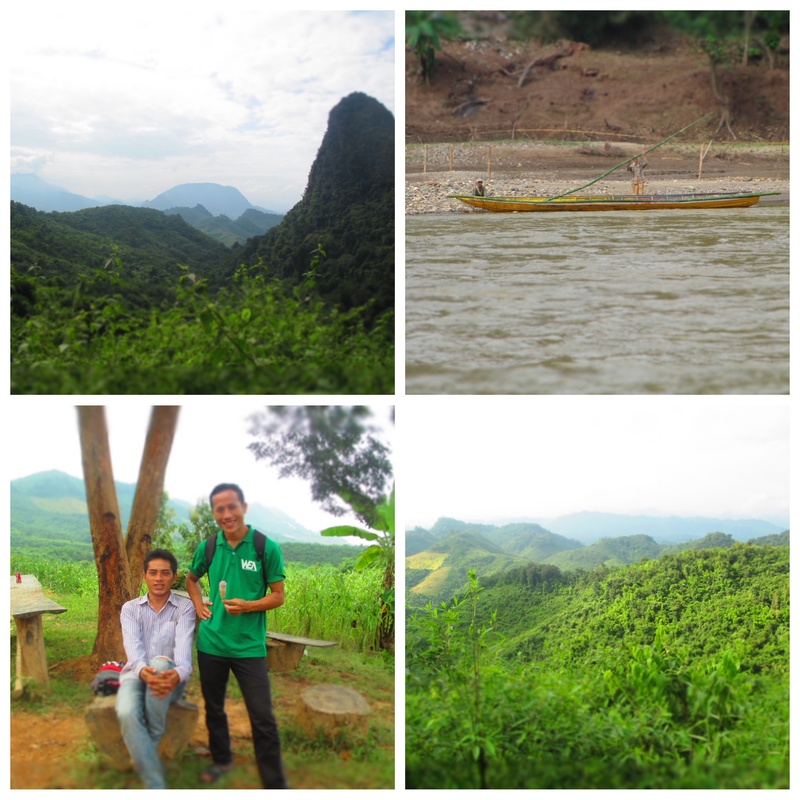 We drove an hour outside of Luang Prabang, hopped a longboat across the Nam Khan river and started walking…up. During small stream crossings, leeches hopped on for a ride and lunch. We stepped over ridiculously big cowpies and stepped in ludicrously high mud until we realized the two were intertwined. Yech! 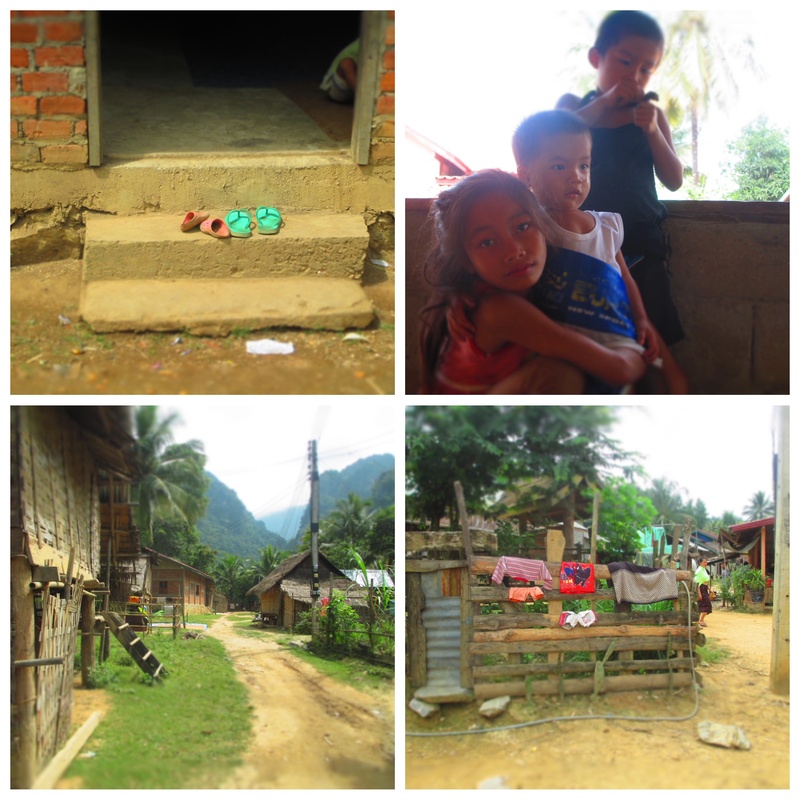 We stopped at a Kamu village to have a water break and small children in tattered clothes gathered around us. We were told we could take their picture if we showed the image to them. It felt odd…like it was staged versus spontaneous. A girl younger than Julia had her baby brother wrapped tightly to her in a sarong and protectively kept his face away from the camera. You won’t see many pictures of people in my blog because I simply struggle to take them. 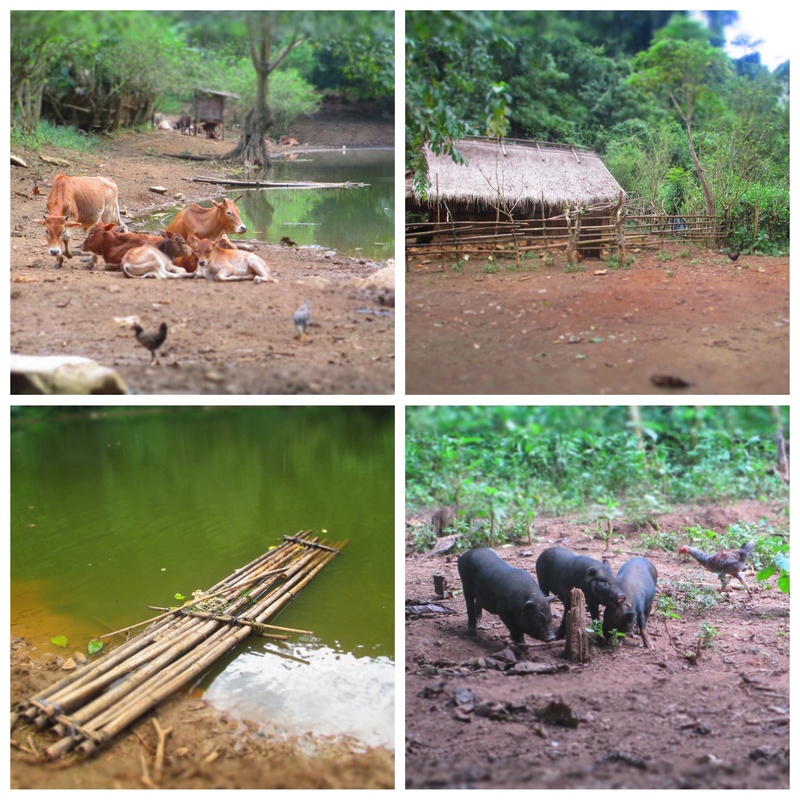 This particular village was set against a putrid pond with pigs, chickens and cows intermingling at the waters edge with children in various states of dress. The village was too small for a school…the kids just didn’t go. Small children and young mothers quickly set up their fabric wares for our perusal. A young child, likely two years old, pantless, climbed down from her mothers lap and defecated in front of where we sat eating our lunch. No Pampers here. Boy did we feel obnoxiously wealthy. We purchased small cloth purses and woven wrist bands from each mother. We pulled out reading and coloring books we had brought for the kids. Out of desperation to make a connection, I opened one book on African animals and began pointing at pictures — it broke the ice and the kids joined in as we all shared Hmong, Lao and English words for each animal. 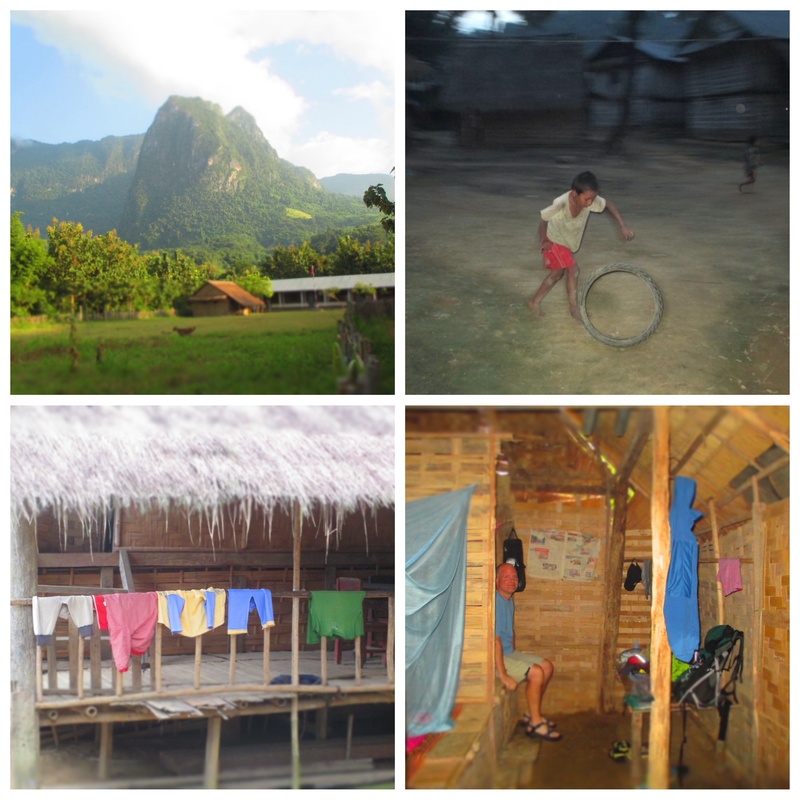 We left the kids coloring as we continued our trek to the Kamu village where we would spend the night. Sean, Julia and I debated what we’d just experienced. Was it ok for kids to live like that? Who were we to judge? Is their reality ok because it’s what they know? As usual, we had multiple points of view and one thing middle age has given me is the comfort to ponder without solid resolution. In reaching the last Kamu village, it felt like an oasis in comparison. The school building sat at the village entrance. Huts were outfitted with mini solar panels and some with satellite dishes. Now, granted, homes were basic…bamboo walls and thatched roofs. Our accommodations for the night were basic as well, a series of thin mattresses on platforms wrapped in mosquito nets. We meandered through the village, which was clearly used to hosting falang (foreigners) as they paid us no heed. At night we gathered with our host family for the dinner they had prepared…chicken soup, mixed vegetables and sticky rice and tried to cross the language barrier. A sweet baby girl sat nestled in her grandfathers lap during our stay…we were told her Kamu name meant “foreigner” as the family’s living was improved through the hosting of funny, large, white falang. With no showers, we washed the mud off with a bucket of water and used the squat toilet only as urgently needed. I felt so badly for one of the German girls, who, hit with a case of intestinal distress, spent the evening navigating the dark to and from the squat. As I lay in bed that night, listening to the village life in full force around me, I thought about how much I cherish the simple pleasures of home — a comfortable bed, a good cup of coffee, a hot shower. We take such simple things and complicate them…what fabric should my duvet be, do I want to drink Sumatra or Colombia today, what thread count and color should my towels be? I’m not sure how, or even if, this trip will change my family. But as the experiences seep in, our comfort zones are expanding and our needs are simplifying. And that satisfies for now. There are many outdoor rec companies in Luang Prabang and they are lined up next to each other on Sisavangvong Road. We chose White Elephant Adventures. We simply told them what we wanted to experience — trekking, kayaking and a home stay and they showed us on google earth where we’d be traveling. Our two guides were great…while language was at times a barrier, they spoke enough English to communicate with us and they also spoke Kamu and Hmong to help us interact with the villagers. We could have had more guidance on the 3 hour kayak portion of the trip — two of the German girls capsized in rapids and I came close to it. All in all, we would recommend White Elephant and emphasize that the trek is not for the faint hearted. Wow! Great words… I am really enjoying traveling along virtually with you. Thank you! Not for the faint hearted indeed….but definately for the BIG hearted. Beautiful writing Rachel. Anna says HI to Julia and misses her….does she have email? Wow, what an incredible experience–I am amazed by and enjoying this opportunity to follow your adventures, thank you for sharing!